Paul Kelly is one of 125 South Melbourne/Sydney Swans players eligible for the team. AFL in NSW has a long and proud history dating back to the 1870s, and while the NSW Australian Football History Society has done a great deal of work to document and collate that history, an avenue to showcase it has been lacking – until now. Enter the NSW Greatest AFL Team of all Time. The team is currently being selected and will be announced at a function next month. Research suggests that from the creation of the VFL in 1897 there have been at least 450 players from NSW that have played in the VFL/AFL and approximately 20 in the SANFL. There have been seven Brownlow Medals won by NSW players, five Magarey Medals and three Sandover Medals. Along the journey, there have been multiple Premiership players, club captains, competition leading goalkickers, state players, club best and fairest winners and All Australians. A selection panel headed by former Sydney Swans chairman Richard Colless has agreed on specific criteria to determine which players are eligible. The team will include 22 players in position plus four emergencies, along with the naming of a captain, vice-captain, coach and coaching panel. The rules governing selection for NSW in State of Origin apply. If a player went to school interstate but their parents remained in NSW, they remain eligible (e.g. Shane Crawford and Neale Daniher). A player had to have played a minimum of 100 games in a senior league (VFL/AFL, SANFL, WAFL). Selection is based on quantitative and qualitative methodologies. Players must be placed in positions where they predominantly played throughout their careers. The team won’t include players from the Australian Capital Territory for several reasons, including that Canberra always competed in Australian National Football Carnivals as a separate entity from NSW, and in 2000 the official ACT Team of the Century was announced. There have been a few attempts at picking the best NSW team, but none meet all the criteria to which has been agreed. It was also considered important that the team have official recognition of the NSW Australian Football History Society and the AFL. To have a Southern NSW/ACT or Riverina team only embraces part of the state. Likewise, being born in NSW and achieving fame elsewhere won’t meet the selection criteria. For instance, there are teams that include Ivor Warne-Smith/Jock McHale/Nipper Truscott (WA and AFL HOF) – they will be excluded on the basis that all of these and others moved interstate as children. 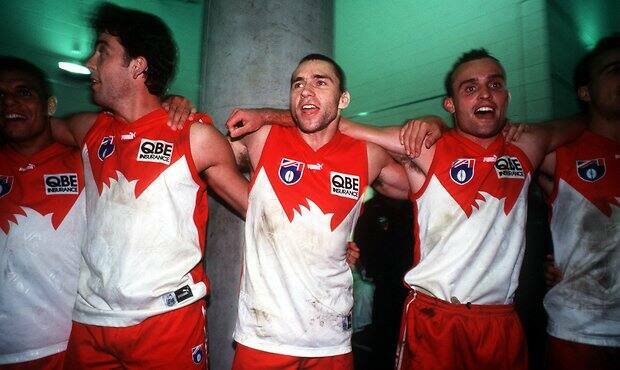 Of the 450 players to have played in the VFL/AFL a staggering 125 played for South Melbourne/Sydney Swans. Commencing with Jack Fleming in 1897, who was recruited from South Broken Hill, to Nick Blakey in 2019, recruited from the Sydney Swans Academy. Given nearly 30 per cent of eligible players played for the Sydney Swans, there is a reasonable probability that there will be several Swans players in the team. The NSW Greatest AFL Team of All Time will be unveiled at the NSW Carbine Club AFL Lunch on Thursday 9 May at the Hyatt Regency, 161 Sussex St, Darling Harbour. The cost is $195 per person or $1950 per table. The event will be compered by Tony Squires.